Spook your guests and trick-or-treaters this Halloween with this animated bat. Perfect for haunted houses! 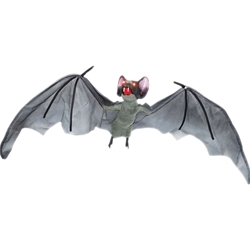 The animated bat with lights and sound features light-up eyes, sound effects, and flapping wings. Use with the sonic spinning motor to create a flying effect. Bat measures 5” long, 59” across, and 18” tall.